Contemporary technology allows us to manifest our prehistoric fascination with observing other humans, and to publish those images, with greater ease than ever. This unprecedented momentum of visual information has thrown down the gauntlet to professional photographers to develop a visual lexicon and message that has a different sort of impact than the rest. The glass of the photographer’s lens, and the glass-fronted public space of the new premises of the International Center of Photography (ICP) in Lower Manhattan are meant to tie into the increasing transparency of our private lives and the ubiquitous presence of private images, shared publicly, through which we have come to communicate as a society. The ICP’s original founder, Cornell Capa (1918–2008) didn’t have to contend with the volume of images that glorify banality to the extent we see today. His motto “The Concerned Photographer” was also the title of a series of exhibits and books that resulted in the establishment of the ICP in 1974 in New York. Former director of Magnum Photos (from 2004 to 2011), Mark Lubell was appointed executive director of the ICP in 2013. He joked in an interview on Vimeo that he went from working for one Capa brother—Robert Capa (1913–1954), who co-founded Magnum Photos together with Henri Cartier-Bresson (1908-2004)—to working for another Capa. Understandably, the Capa brothers’ ethos is forever present in Lubell’s mind and he wants to steer the ICP in playing the role of arbiter in society to help us understand what all this visual communication means. 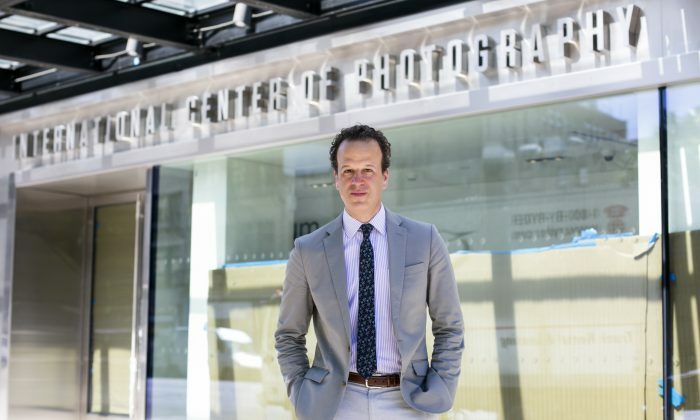 He also sees the ICP as a “big tent” that welcomes all types of photography and visual culture. The first exhibition, Public, Private, Secret, presents a wide range of historical and contemporary works by artists including Zach Blas, Martine Syms, Natalie Bookchin, Cindy Sherman, Nan Goldin, and Andy Warhol on a topic that is affecting our lives today. “It is for the greater good, it’s a societal value to have a deeper understanding of what is privacy in today’s world. And that sticking very much with Cornell Capa and the mission of the ICP to understand the important issues of the day,” Lubell told Epoch Times. He explained that people are using images like a continued narrative. As such, the image has changed from being a photograph of a time and a place (and something to keep), to more of a means of communication. He wants the ICP to play an integral role in this visual cultural dialog. Born and raised in New York, Lubell had firsthand experience of the power of the visual record. After the 9/11 terrorist attacks on the United States, everybody just wanted to do something, he recounts, but no one knew what to do. He got involved in an exhibition on Prince Street that brought together images from before, during, and after the 9/11 event. The uncredited images, taken by great photographers as well as amateurs, were scanned immediately as they came in. Each was given a number, and hung on a wire. The Prince Street store, with hundreds of images hanging on display became the unofficial memorial site, attracting over 2,000 visitors a day who clambered into a very small space and lined up outside to see it. The website associated with it had 2 billion hits in four months, and 33 copies of the exhibition toured all over the world. It resulted in a best-selling book, “Here Is New York: A Democracy of Photographs,” which raised a million dollars within a very short period of time that was donated to charity. At one point the relationship between a photographer and his audience was one to many thousands or hundreds of thousands of people. Now it’s millions to millions. Though this communication mostly happens in cyberspace, Lubell finds this shift as exciting as anyone else. He believes that looking at material and experiencing something with other people is very important, and he wants to foster creativity and an environment so that artists and amateurs will also create works for the specific space of the ICP. He is emphatic in his wish for people to recognize the importance of coming together to view a photographic exhibition, as opposed to looking at a screen in a solitary environment. “The 9/11 exhibition is a great example. It’s not until you see these pictures alongside other pictures, and with other people who are seeing the pictures that you have this very human experience,” said Lubell. The danger of seeing things through carefully curated channels is that it leads us to abdicate our discernment and ability to prioritize information according to our values. He mentions that the algorithms that track everything from our internet shopping habits to our political views have lead us to have a siloed experience where we only get information that conforms to our mind-set. Implied in this is the fact that should the truth be in opposition to our beliefs or current knowledge, we may never get to find out. The only way to break out of this impasse is do another very human thing, and seek out other humans with whom to experience and talk about the content—something that in Lubell’s experience is sure to create a better understanding. “As long as we are people, we’re going to want to understand an issue deeper, and we are going to engage in that question, whatever it is—by pencil, paintbrush, digital or analog camera, and there’s always going to be a place where to converge and have a dialog,” he said. The new ICP Museum space, located at 250 Bowery, as well as the first exhibition, Public, Private, Secret, are due to open to the public on June 23, 2016.